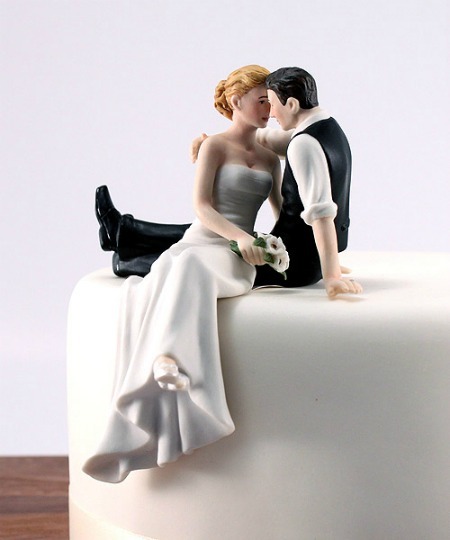 A simple wedding cake is a great way to celebrate your wedding in an inexpensive and fun way. Without the necessity to spend a great deal of time or money on an elaborate confection, you can have the freedom to please your guests with simple elegance. These simple wedding cake ideas are designed to be easy to make, and you can probably make them at home. Something to keep in mind is that the more guests you have, the bigger your cake should be, so you might want to consider a stacked option if you have more than 20 or so guests. 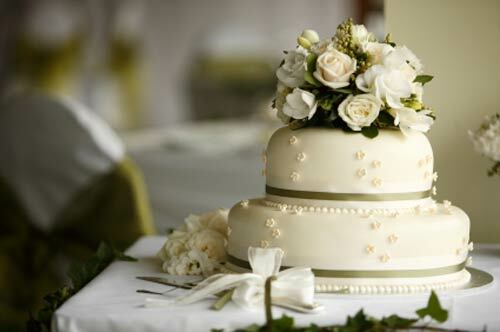 In this top ten list you will find both simple stacked and single wedding cakes. The stacked box cake can be decorated in a variety of ways, filled with jam or icing, and covered with fondant or icing depending on your preference. A box cake is a square cake that has been stacked to be completely square. Interesting decorating ideas include using a colored icing and topping the cake with a fondant or silk bow so that the cake looks like a gift. You could also use fondant to create a smooth look and then decorate with icing ribbons up the side of the cake and around the base. A stacked circle cake is usually an ascending layer of cakes that get smaller as they go up. While this might sound complex at first, it’s relatively easy to do. Depending on the number of guests, the first layer should be one to four layers of cake thick, with each progressive layer thinner and smaller as you go up. 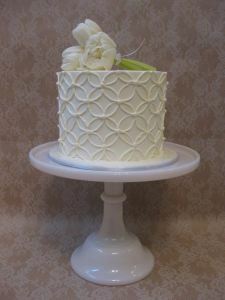 Interesting decorating ideas include using a different color of fondant or icing on each circle, decorating the top of the cakes with a red line of icing to the top, where you have placed wedding figures (this will create a staircase effect), or using simple white fondant and adding a colorful ribbon around the top edge of each layer. A smaller version of the stacked circle cake, the simple circle cake can be one to five layers high, but each layer will be the same size. 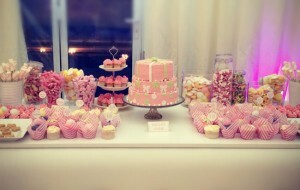 Decorate with fondant or icing, touch up with bows, stars, the couples name, and colored icing. A simple yet popular wedding cake design is the cupcake cake. 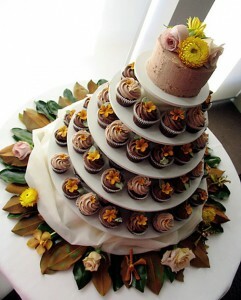 This cake is made by creating a tier of cupcakes, usually on a tiered dessert tray. Cupcakes can be decorated as you see fit, and each can be topped with a wedding favor. This style of wedding cake reduces mess, and ensures that everyone gets a piece, because you can make about 25% more cupcakes than you have guests to make sure everyone gets enough. A simple rectangular design that can be decorated in hundreds of ways, the sheet cake is great for simple weddings. 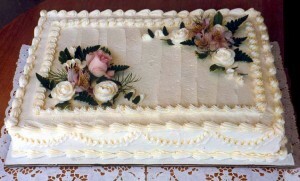 Sheet cakes are especially popular at retro weddings that require simplistic designs. 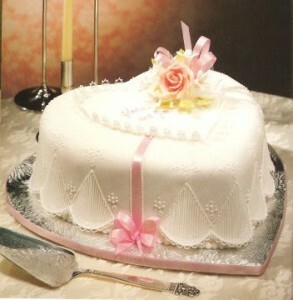 Sheet cakes can be decorated with fondant, bows, hearts, ribbons, icing, and more. 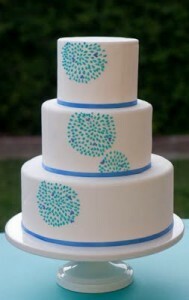 Want a simple cake with a simple and elegant design. Take your favorite style of cake and use the tip of a butter knife to draw elegant curls and grooves in the side of the fondant. You might want to stencil these out in advance. Fondant flowers can be purchased or made using a mold, and same color flowers add a simply beautiful touch that is simple and easy to do. Take your favorite cake in any color you like and simply apply fondant flowers to the top, the sides, or the base as desired. For romantic chic, try choosing a heart shaped cake. 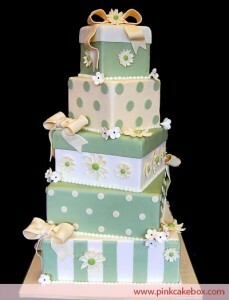 This cake can be stacked or layered as desired, and makes an excellent statement cake for a small wedding scene. Heart shaped cakes can be made using a simple heart shaped baking form, or can be cut out after baking as desired. 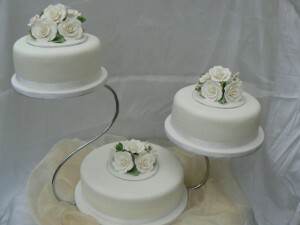 A two tier cake is usually square, but similar to the tiered round cake in design. 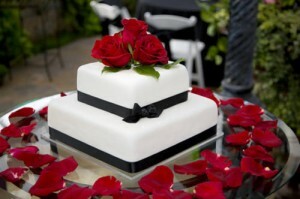 For this cake, you simply choose a large square or rectangular cake and then top it with a smaller of the same shape. Alternately, you can choose to top it with a different shape to create some geometric appeal, and then decorate as you like. Elevated cakes are one of the most popular styles for wedding cakes, but are actually easy to do provided you have the right tools. Purchase a tiered cake stand in whatever style you like and bake the cake onto that. 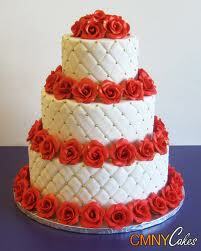 It will give a beautiful simple look of suspension which is the rival of any simple wedding cake design. 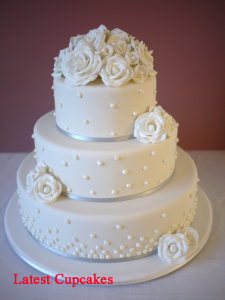 Although this wedding cake is simple, elegance is not lost. That makes it the best wedding cake that is also simple.